Although no more than 241 H.R.G.s were built, the make made history in England. The factory was founded in 1936 by technician E.A. Halford, mechanic Guy Robins and designer H.R. Godfrey at Oakcroft Road, Chessington. Godfrey's designs included the G.N. sports cars. H.R.G. 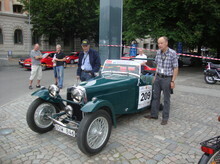 built sports cars without suspension or any other comforts, but they were very fast. The long bonnet concealed an engine by Singer or Meadows. In the Spring of 1936, a first prototype appeared, and by the end of that year five cars had already been delivered. The pre-war models did not yet have hydraulic brakes and the cars had rigid front and rear axles until well into the '50s. The remaining 207 cars were produced after the Second World War. A last prototype of the H.R.G. make appeared in 1966. Suggest a link relating to H.R.G. Suggest a Contact relating to H.R.G.